Mad Props is a duel minigame found in Mario Party 7. The name is a pun on the saying "mad props", meaning to give someone a lot of respect and credit, with the fact that "props" could also be short for "propellers". The minigame is able to save the record. 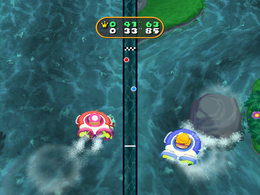 Players use their hovercrafts to race to the finish line, avoiding the rocks as they maneuver through the winding river. Rules – "Use the boat's propellers to navigate through the white-water rapids." Advice – "The harder you press, the faster the props will turn." This page was last edited on August 23, 2018, at 22:21.